In the early 1990’s, when Juan Manuel Lillo’s career was in its early days he did something that was thought to be one of the most radical ideas at the time. He ‘invented’ a new formation. I use the word ‘invented’ with hesitation for the same reason Lillo didn’t believe there was anything radical about doing so. His pragmatic study of football had led him to the conclusion that football was nothing more than the relationship between time and space. In doing so, his view of formations was no longer the same as the traditional view where players must be defined to a position and managers’ formations clearly stated how many defenders, midfielders, or attackers the team was going to play with. Nowadays, many coaches presume that by utilizing a certain formation and fixing players to a certain position, they will have the same results as they see elsewhere. Lillo’s statement indicates otherwise. He approached formations and structures as we all should; with an understanding of his team’s strengths, weaknesses, and common interactions between his players. Under this premise Lillo was able to construct an organized structure which fit the mold of his team and would create the right conditions to achieve success. In order to designate a structure where our teams will play, we must take into account and analyze specific aspects of the game and how they will influence the team’s play. Although it may seem obvious, it’s important to be aware of these components of the game and how they will affect the determined structure. They are the following. 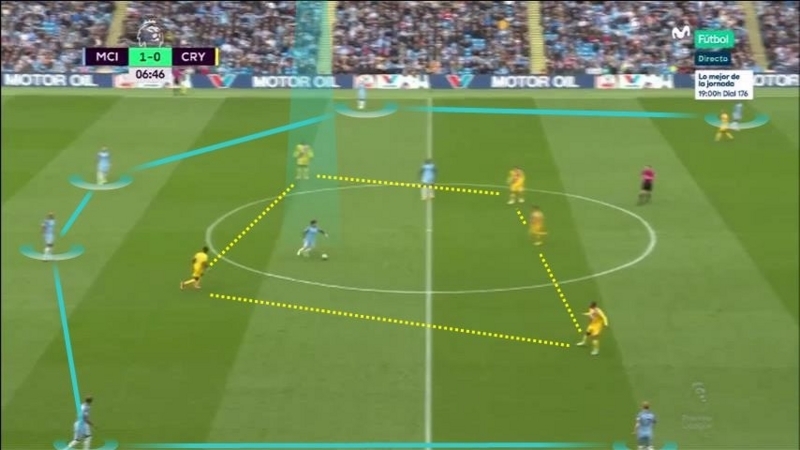 Obviously the structure is determined by the initial positioning of the players but once the game is underway its vital to adapt the positioning based on these aforementioned components. The distance between players is how the structure will keep its shape as it conforms to certain situations created by any of the previously mentioned variables. For example, the team’s shape at the beginning of the match could look like a traditional 4-3-3 as the following image shows. However, due to certain characteristics in certain positions, the structure may adapt to look like the following image. What’s important to keep in mind, is that no matter where a player may find himself due to a sequence of play, the structure stays the same by having another player occupying that space. The distances between each player are what mark the correct positioning of the team. The following images give us an idea what we should look for in an efficient structure. Through a variety of formations we see that each team is able to create width and depth in order to create the necessary space needed for the center players to build the attack. The following image shows Guardiola’s organized attack. They have created the necessary width for David Silva to check into the pocket of space between lines. Within Luis Enrique’s structure, the team has width and depth. Busquets (highlighted in the center of the field) plays within the created pocket of space between lines. 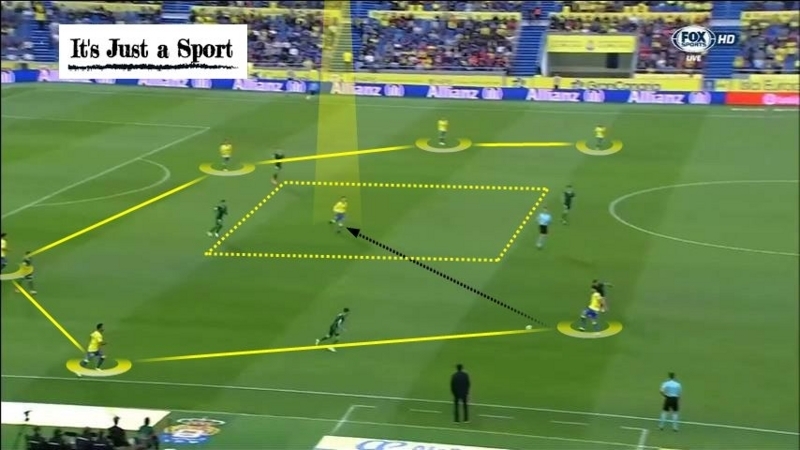 Quique Setien’s Las Palmas also has an effective structure which develops the necessary space for Roque Mesa (highlighted in yellow). In this image, the ball is played to a checking striker who plays it to Roque Mesa in the space depicted by the dotted yellow rectangle. 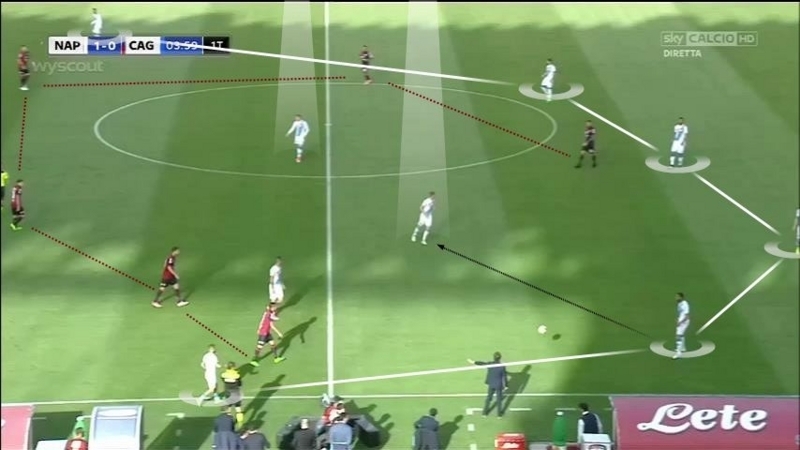 Napoli is known for their positional play but everything starts with their good structure which allows them to play through the center of the pitch. The centerbacks provide depth through the back and the wingers give the team depth and width. As the images have shown, a good team structure is the basis to creating a functional and successful system of play. Not only should it have a clear and defined geometrical shape, but it should follow a series of premises. Firstly, as I’ve mentioned, the structure should have width to hold opposing players in wide areas for the purpose of producing the space in the middle. Lillo constantly discusses the important of this condition. He states that due to the offside rule, the opposing team has the ability to shorten the field of play by simply pushing up. 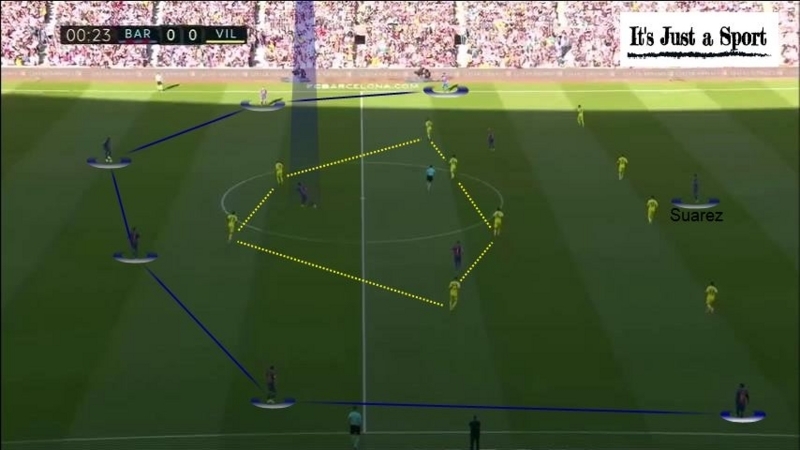 On the other hand, the width cannot be modifiable and in turn provides an opportunity to constantly amplify the field of play by solely positioning players as wide as possible. Secondly, the structure should have depth created by attacking and defensive players alike. As I’ve mentioned, the offside rule impedes creating depth past the last defender. For this reason, the central backs and goalkeeper are pivotal pieces to providing depth. They must never crowd the center of the pitch because in doing so they minimize the amount of space the team has available. Lastly, when these two premises have been met, the team needs players in the space created via depth and width. This is where the interactions characterized by positional play will surface. The shape, number, and characteristics of the players in this space will depend on the team and their strengths and weaknesses. This will also dictate how the team will create numerical and positional superiority which will give way to clear passing lanes and, as Mourinho stated, propel action forward. Once the structure has been set, and the team understands the limits of the space and the distances between players, there are no determined positions. That is to say, no certain player must stay in a certain zone and or position. They have the freedom to move between areas as long as there is someone marking the structure at all times. This type of freedom allows for malleable formations and shapes as you might see in teams which utilize positional play. Sampaoli's Sevilla does this very well as you can see in this previous post. Teams should strive to achieve this organic structure. The second objective (and third installment) of positional play is the interaction between the players. This objective would not be possible without a well crafted, intelligent, organic structure which not only provides the required elements but is also functional. Check back for next week’s post on interactions, and like always, if you have any questions about any of the material discussed in this article I’m always up for a discussion on Twitter (@IJASport), at my email ijasport@gmail.com, or via facebook (It's Just a Sport).